The Microsoft Enterprise Library Integration Pack for Microsoft Azure extends Enterprise Library to include additional support for Azure applications. It includes two additional application blocks designed specifically to meet the requirements of Azure hosted applications: the Autoscaling Application Block and the Transient Fault Handling Application Block. For more information about Enterprise Library, see "Microsoft Enterprise Library" on MSDN. The application blocks in the Enterprise Library Integration Pack for Microsoft Azure use the same configuration infrastructure and tools as the standard Enterprise Library application blocks. For more information, see "Configuring Enterprise Library" on MSDN. For more information about configuring the Autoscaling Application Block, see "Entering Configuration Information." For more information about configuring the Transient Fault Handling Application Block, see "Entering Configuration Information." The blocks in the Enterprise Library Integration Pack for Microsoft Azure are designed to be used with applications hosted in Azure; however, you do not need to host the blocks in Azure roles. For more information about referencing Enterprise Library assemblies, dependencies in Enterprise Library, and referencing and creating Enterprise Library objects, see "Using Enterprise Library in Applications." For more information about using the Autoscaling Application Block with your Azure applications, see "Hosting the Autoscaling Application Block." For more information about using the Transient Fault Handling Application Block with your Azure applications, see "Hosting the Transient Fault Handling Application Block." The blocks in the Enterprise Library Integration Pack for Microsoft Azure include a number of extension points that enable you to further customize their behavior. For more information about extending the Autoscaling Application Block, see "Extending and Modifying the Autoscaling Application Block." For more information about extending the Transient Fault Handling Application Block, see "Extending and Modifying the Transient Fault Handling Application Block." The Reference Documentation and the Developer's Guide make frequent references to elements of Azure. The following diagram shows the key parts of Azure that are relevant to the Enterprise Library Integration Pack for Azure. Each Azure subscription is identified by a unique subscription ID. To manage a Azure subscription, you can either use the Azure Management Portal where you authenticate using a Windows Live ID, or use the Azure Management API, which is secured using a Management API certificate. Within a Azure subscription, you can deploy your code to web and worker roles within a Hosted Service. Each web or worker role can have multiple instances at run time. Any certificates used by the web and worker roles (such as SSL certificates) are stored in the hosted service. Each Azure subscription can include multiple Azure storage accounts. 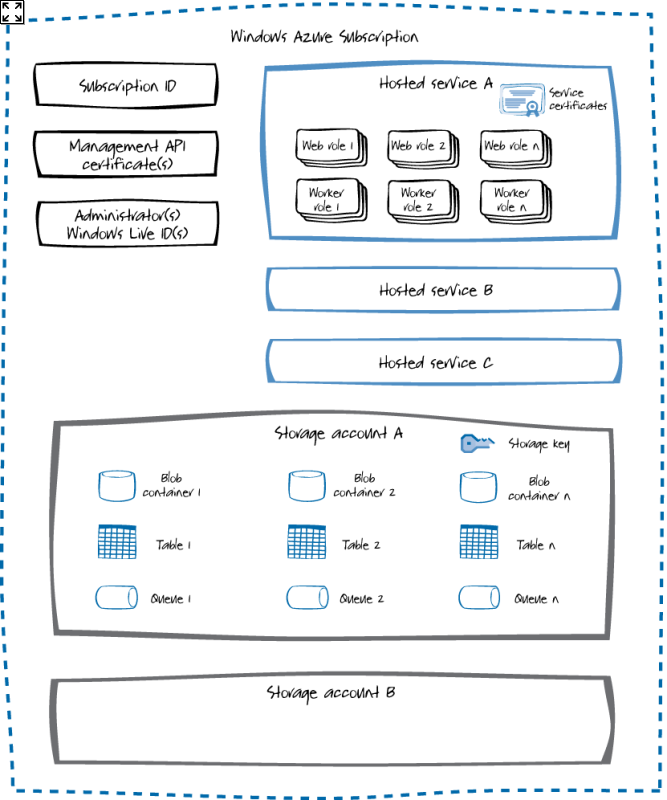 Each storage account can contain multiple blob containers, tables, and queues. Access to storage accounts is managed using storage keys. For more information about Azure, web roles, worker roles, and storage accounts, see the chapter "Introduction to Microsoft Azure" in the Developer's Guide.